Every 66 seconds this year, an American will develop Alzheimer's disease, according to the Alzheimer's Association annual report, released Tuesday. By the year 2050, that number is expected to double to one every 33 seconds. Those startling statistics are mirrored worldwide. In 2016, the World Alzheimer's Report estimated that 47 million people around the globe had dementia. To put that in perspective, it's a bit more than the current population of Spain. And because nine of 10 people with dementia in low- and middle-income countries and half of those in high-income countries are not diagnosed, the global number of people diagnosed is expected to triple by 2050. "What is driving these numbers is that there is no disease modifying treatment, no prevention and no cure," said Ruth Drew, director of family and information services for the Alzheimer's Association. "And while U.S. deaths from Alzheimer's have doubled in the last 15 years, an increase of 89%, deaths from other major diseases have been declining." For example, said Drew, deaths from heart disease, the No. 1 killer of Americans, have declined by 14% over the same period while HIV deaths have dropped by 54%, stroke deaths by 21% and prostate cancer deaths by 9%. "Other diseases have declined because of significant investments in research that produce treatments and techniques to reduce risk, sometimes even a cure," Drew said. "The issue is mainly funding," agreed Rudy Tanzi, a Harvard professor of neurology who also heads up MassGeneral's Genetics and Aging Research Unit. "We are a knowledge-rich yet budget-constrained field. We have many clues about how to stop Alzheimer's, especially from recent genetic studies, but insufficient funds to explore how." Experts point out that without additional funding and a breakthrough, Alzheimer's could be the disease that breaks the nation's health care bank. In 2017, for the first time, total costs for caring for those living with Alzheimer's and other dementias hit $259 billion -- over a quarter of a trillion dollars. "Already, Alzheimer's consumes one in every five Medicare/Medicaid dollars," Tanzi said. "With 71 million baby boomers headed toward risk age, this will go to one in three, perhaps in the next decade, at which point Alzheimer's will single-handedly collapse Medicare/Medicaid." "It will also impact the work force and our economy," Drew added. "Because every family affected will be making caregiving choices they will have at home. They will be absent more for doctor visits ... and other caregiving duties." There's more. The association's report adds another startling statistic, the hidden cost of caregiving: In 2016, those who took care of loved ones with dementia provided an "estimated 18.2 billion hours of unpaid assistance, a contribution to the nation valued at $230.1 billion." And that's just the monetary impact of caregiving. Experts say no one can put a number on the emotional and health impact of caring for a loved one with dementia. "Alzheimer's is like a leaky boat in a hurricane," said Huntington Potter, director of the Rocky Mountain Alzheimer's Disease Center. "We have to both bail like mad and fix the leaks. Researchers are working hard to fix the leaks, but it will take time; for now, the main load is carried by the bailing caregivers. They are on the front lines in this war against Alzheimer's." Kristen Beatty is one of those fighting on the front lines. She and her brother, Doug Rider, are caring for their 78-year-old father, Ray, who was diagnosed with Alzheimer's about 10 years ago. "My father was a lifer in the Air Force, a colonel, a fighter pilot and a Vietnam veteran," Beatty said. "My mom, Sue, was a proper military wife, and between them, they had a 'don't ask, don't tell' attitude about informing us kids about his illness." It wasn't until they took over their dad's care that they learned just what their mother had been going through. "He developed a sense of paranoia and thought people were stealing from him and believed everyone was out to get him," Beatty said. "He would go to bed early but then get up and was up all night long, arguing with mom. "They would have conversations and arguments over and over again. She wasn't getting any sleep. She was exhausted with the constant care and pressure. But she never once complained. She didn't want us to be scared." But in 2012, after five years of caregiving, Sue Rider dropped dead of a heart attack. "We say that she died of a broken heart," Beatty said. "Died from the stress of caring for him. She was eating super healthy, walking every day, taking very good care of herself. So I truly believe it was the stress. "It's awful, just awful," she said with a catch in her voice. "My brother and I feel so guilty, because we could have supported her, but she would not ask for help; she would not consider moving him into a facility; she would not go to support groups." Doug Rider with dad Ray, who was diagnosed with Alzheimer's 10 years ago. Today, Beatty works with the Alzheimer's Association to call attention to the burden of caregiving. She points people to the resources available to them online and stresses that no one should feel as if they are alone. "My mom was the glue of the family, a genuine sweet and amazing soul. It's painful, really painful. What I do today is all powered by supporting her, so that it wasn't in vain," Beatty said. "We collectively as a nation need to step up, because Alzheimer's is an epidemic, and our health care system is not set up to support caregivers." The cost of Alzheimer's, including caregiving, is a reality that will soon affect everyone, say experts. "A lot of people think that 'Alzheimer's doesn't affect me because I'm not old' or 'I don't have it in my family, so it's really not my problem,' " Drew said. "What we've come to understand is, if you have a brain, you're at risk for Alzheimer's disease." "If we all live to age 85 -- and who doesn't hope to live at least that long? 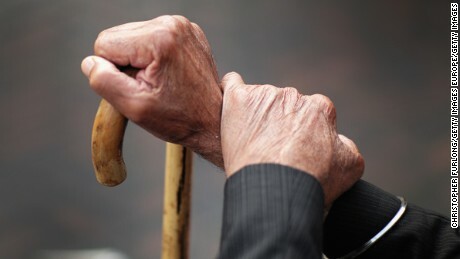 -- almost half of us will have Alzheimer's disease," Potter said, "and the other half will be caregivers. No one is immune."